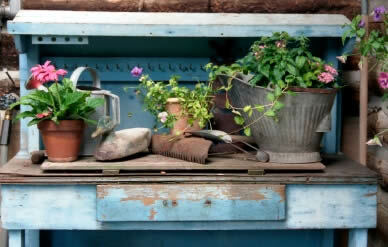 Container gardening can add interest to those areas in shade you may not know what to do with. Containers and pots can be moved around the garden for a different design whenever you feel like it, and there is no limit to the types and sizes of containers you put your plants in provided they have drainage holes. You will find many beautiful containers for sale at garden centres but I suggest you look around your home and see what you already have that could be used for planting. Any container that will hold soil will do provided you can make the drainage holes. Be creative and consider using: old boots, clay drainage pipe, watering can, bucket, or a wheel barrow. Go round some yard sales and see what you can find. It is recommended to put larger containers in the place where you want them while they are still empty. They are heavy when filled with soil and will be more difficult to move once you have planted them up. Good drainage is essential to prevent roots being damaged from too much water. Cover the drainage holes with pieces of broken clay pots, and/or add a layer of pebbles or polystyrene in the bottom of the container. It's a good idea to raise your container off the ground to make it harder for bugs to enter through the holes. You can stand you container on feet or bricks. This helps your container to drain more effectively as well. If it is a breakable pot, make sure it can't blow over! 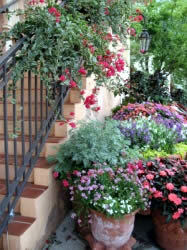 Soil for container gardening is different from soil used in the ground. Container soil needs to drain well and still hold enough moisture and nutrients to grow healthy roots. Soil mixes for different species of plants will be given within the content of their page on this site if they have any special requirements. Whatever plants you use for container gardening in shade, remember that they need regular watering and feeding to keep them healthy and looking good.